Ananda Ramayana is a Sanskrit text traditionally ascribed to the sage Valmiki, who is also credited with the Adbhuta Ramayana, Valmiki Ramayana, and the Yoga Vasishta (Vasishta Ramayana). The text has received little attention from scholars to date, though in some traditions it is considered one of the principles sources of Rama stories. Ravana once approached Brahma, inquiring as to how his own death would come about. Brahma responded that the son of Kausalya and Dasharatha would be the cause of his death. Enraged, Ravana abducted Kausalya immediately prior to her wedding, and placed her in a box on a deserted island in the middle of the ocean. The sage Narada described her whereabouts to Dasharatha, who then brought his army to the shore to rescue her. The army began to cross the ocean in boats, approaching the island of Kausalya’s captivity. Hearing of Dasharatha’s rescue attempt, Ravana sent his rakshasa (demon) army. In the ensuing battle, Dasharatha’s army was annihilated, but Dasharatha escaped on a wooden plank, floating on the ocean for many days. Eventually he landed upon the island of Kausalya’s captivity, and happened upon the box in which she was enclosed. Narada and other sages quickly arrived and performed a wedding ceremony, after which Dasharatha and Kausalya were enclosed in the box. Unaware of these events, Ravana went to Brahma and told him that his prediction had been rendered false, as he had killed Dasharatha and was holding Kausalya captive in the box. But knowing that his words must always be true, Brahma had the box brought to his and Ravana’s presence and opened. Seeing Dasharatha and Kausalya in the box, Ravana was humiliated, and planned to kill them both, but his wife Mandodari persuaded him otherwise. Eventually Dasharatha and Kausalya went to Ayodhya, where they lived happily, eventually giving birth to Rama and his three brothers. King Padmaksha worshipped Lakshmi and asked if she would become his daughter. Lakshmi countered that she could only act on Vishnu’s orders. King Padmaksha then worshipped Vishnu, pleasing him with his tapas. Vishnu gave him a piece of fruit and subsequently disappeared. Within the fruit was a small girl, who the king raised as his daughter. When she was grown, Padmaksha arranged a swayamvara for her, so that she could choose her own husband. 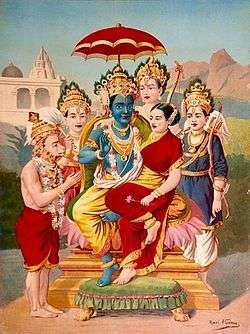 Padmaksha stated that whoever could change the color of his skin to blue could marry the girl. A fierce battle ensued between humans, devas, and rakshasas. The rakshasas tried to capture her, but she hid in the flames of a fire, and they were unable to locate her. They nonetheless destroyed everything in the area, killing Padmaksha. After their departure, the girl left the fire, but was spotted by Ravana as he was flying by. Ravana tried to capture her, but she again jumped into the fire. Ravana attempted to extinguish the fire, but still could not find her, instead finding five gems in the ashes. Ravana took the gems in a box to Lanka and asked Mandodari, his wife, to look after them, but when she opened the box she saw a beautiful girl. Mandodari realized that this girl could destroy the rakshasa race, and recommended that she be thrown into a forest. Trusting her judgment, Ravana had her taken to a distant forest. As she was being taken away, she exclaimed that: “I will return to kill Ravana, along with his sons and family. Arriving a third time, I will ….”. The rakshasas were frightened, and Ravana wished to kill her, but Mandodari dissuaded him. Thus she was taken to the land of Janaka, and the box in which she was carried was buried under the ground. When Janaka was preparing for a yajna, he uncovered the box, and raised the girl in his home as Sita. When Hanuman first arrived in Lanka, he searched everywhere for Sita. At one point, he mistook the sleeping Mandodari for Sita. Realizing his mistake, he wondered why she looked like Sita. Parvati, who was listening to the story from Shiva, asked why there was a similarity in their appearance. Shiva responded that Ravana’s mother Kaikasi had once sent Ravana to Shiva to obtain a beautiful Shivalinga for her. Ravana had pleased Shiva and given him two boons, one of which he used to obtain the Atmalinga. With the other, he asked for Parvati as his wife. Shiva gave both to Ravana, but told him that if he dropped the Atmalinga, it would remain installed where it fell and would move no further. And so Ravana departed with Parvati and the linga. Parvati prayed to Vishnu for help, and he appeared to Shiva disguised as a Brahmana. The Brahmana told Ravana that he had been misled, and that the Parvati she gave him was really a fake version. The real Parvati, he said, was in the netherworlds hiding from him. Ravana then entrusted the linga to the Brahmana, and set off in search of the ‘real’ Parvati. After Ravana had left, the Brahmana (Vishnu) consecrated the linga and departed. According to the Ananda Ramayana, this is the origin of the linga at Gokarna. Ravana eventually returned to Gokarna to perform the intense tapas, which later earned him the boons from Brahma that made him invincible to everyone but humans. Thus Vishnu was later able to incarnate as Rama in order to defeat Ravana. Rama sent Hanuman to bring a linga from Kashi (modern day Varanasi), the city of Shiva. Hanuman was delayed, however, but because the muhurta (auspicious time for an event) was about to pass, Rama formed a linga made of sand and consecrated it instead. Hanuman returned, and was disappointed to see that Rama had gone ahead with the consecration. Rama informed him, however, that if he removed the sand linga, he would consecrate the one Hanuman brought from Kashi. But Hanuman’s efforts were to no avail, and recognizing his own pride he worshipped Rama and his pride dissipated. Rama then consecrated Hanuman’s linga so that both would remain. Also included is the Ramashtakastotram. ↑ Chhawchharia, Sri Ajai Kumar (2010). Adbhuta Ramayana. Varanasi, India: Chaukhamba Surbharati Prakashan. p. 520. ISBN 978-93-8032-604-7. ↑ Nagar, Shantilal (translator) (2006). Ananda Ramayana. Delhi, India: Parimal Publications. p. 946. ISBN 81-7110-282-4.